Tomb of Christ Uncovered: Can Science Prove Events From Gospel Were Real? Modern archeological discoveries are convincing enough to make skeptics believe that Biblical events are more than just the fruit of someone’s imagination, several leading experts told RIA Novosti. 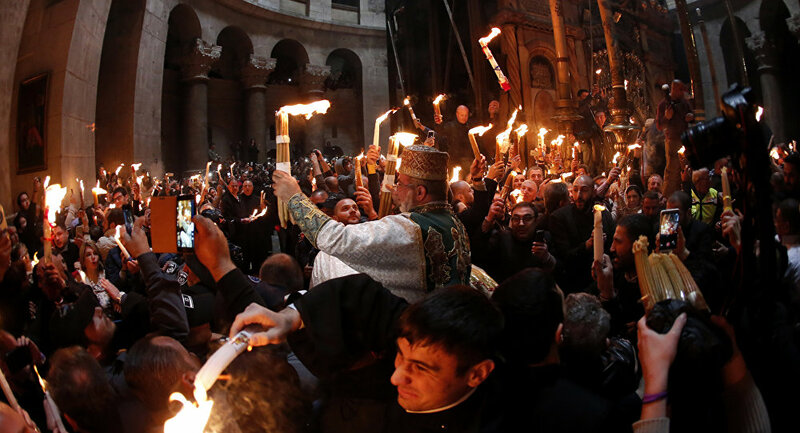 For the first time in five centuries, archaeologists opened Christians’ holiest spot – the tomb of Jesus Christ located in the Church of the Holy Sepulchre in the Old City of Jerusalem to see how the tomb initially looked like. When the marble plate placed over the tomb in 1555 was pushed, the researchers discovered a gray-beige stone surface beneath it. In order to find out what this surface is, the scientists will conduct a series of instrumental studies to find out, among other things, why Flavia Iulia Helena, the mother of the Roman Emperor Constantine I said in the 4th century that it was the place Jesus Christ was actually buried at. According to the Gospel, the body of Jesus Christ after his death was put in one of the burial caves carved into the mountain. That is where He rose on the third day. “I think that Christian believers have little doubt in what the Bible says. As for the skeptics, they want proof. Theology has come a long way making great discoveries that should have dispelled all doubt, but this is not happening,” Moscow-based Catholic theologian Alexei Yudin said. Alexei Yudin mentioned the ancient scrolls found by shepherds along the northwest shore of the Dead Sea about 70 years ago as one of the most significant and convincing discoveries of this kind ever made. Also known as the Qumran Caves Scrolls, they date from the last three centuries BCE and the first century CE. The texts are of great historical, religious, and linguistic significance because they include the third oldest known surviving manuscripts of works later included in the Hebrew Bible canon, along with deuterocanonical and extra-biblical manuscripts. “The Qumran Caves Scrolls are proof of the existence of a community John the Baptist very possibly belonged to. This means that we have historical proof of [what is said in the Bible], Yudin continued. He added that 19th century science dismissed the biblical events as a myth, but the discovery of the Qumran Scrolls changed that. “It was no longer possible to insist that the entire story of Christ is a fairy tale,” he explained. Rector of the Institute of Christian Psychology Andrei Lorgus mentioned as another example the 1961 discovery of a limestone plate in Israel with the name of Pontius Pilate and the “Prefect of Judea” written on its surface. According to the Bible it was Pontius Pilate who ordered Jesus Christ to be crucified. “Before that many believed that the Gospels were one big myth and had nothing to do with historical truth,” Lorgus said. There has been much speculation going on about the authenticity of relics having to do with the person of Jesus Christ Himself. Thus there are several Holy Chalices, of Holy Grails, which Jesus used at the Last Supper to serve the wine and several lances of Longinus that pierced the side of Jesus during His crucifixion that are currently on display in various parts of the world. However, Roman Lunkin, the head of the Russian Academy of Sciences’ Center of Religious and Societal Studies, said that what really matters for the Church is the relics’ spiritual value, rather than their authenticity.